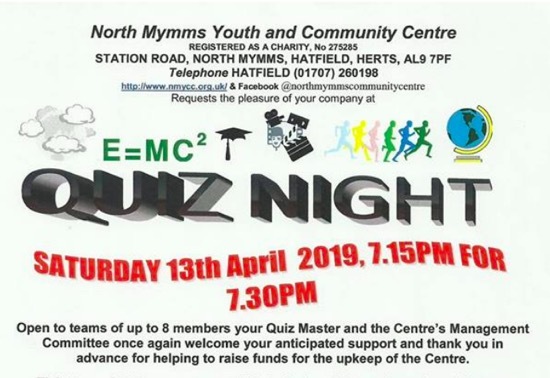 North Mymms Youth and Community Centre is hosting another of its popular quiz nights and inviting teams of up to eight members to book early. Tickets are £10 per person, which includes table snacks and a chicken or vegetarian supper. It’s a BYOB event with participants able to bring their own drinks and glasses. There’ll be a raffle with prizes. The quiz night will be held at the centre on Saturday 13 April with participants invited from 7.15pm for 7.30pm. The centre’s management team says that anyone interested in taking part should book their table and confirm numbers and food orders early to avoid disappointment. Booking details are contained in the quiz night flyer embedded below. Payment is requested in advance. Proceeds will be used for the upkeep of the centre.